The Federal Environment Minister’s decision to approve the Carmichael Coal Mine was set aside by consent in August 2015 after an error was identified. Shortly afterwards the federal government launched an extraordinary attack on widened standing for judicial review in s 487 of the Environment Protection and Biodiversity Conservation Act 1999 (Cth) (EPBC Act). The Attorney-General claimed the law “provides a red carpet” for “vigilante litigation” and there has been a rise of “lawfare” by “radical green activists”. The government’s arguments referred to a campaign proposed in 2011 by some conservation groups to use the courts to obstruct and delay coal projects. This article examines these claims based on a survey of cases seeking judicial review under the EPBC Act and finds that the claims made were fictional. No flood of litigation has occurred. Third parties have brought only 30 cases for judicial review during the 15 years in which the Act has operated. These cases involved only 0.55% of projects assessed under the EPBC Act. None of these challenges has been dismissed as frivolous or vexatious or an abuse of process. There is no evidence that the widened standing for judicial review of EPBC Act decisions has actually been abused. This article analyses the objective of applying strategic environmental assessment (SEA) to offshore oil and gas development in Australia. Aside from fisheries assessments, and in the land use planning sector, SEA under the Environment Protection and Biodiversity Conservation Act 1999 (Cth) (EPBC Act) is applied mainly to the energy sector, both offshore oil and gas, and onshore energy – primarily iron ore development. The article reviews international experiences of applying SEA to offshore energy development, with specific reference to the United Kingdom, to enable comparisons to be made with the purpose of the EPBC Act offshore assessments. Findings are that while the SEA in Western Australia of the Browse Basin gas development was consistent with overseas experience in contributing towards (ecologically) sustainable development, recent and current application in Commonwealth, Northern Territory and South Australian waters has taken a different approach in advancing the regulatory reform agenda. In January 2015, the Queensland Labor Party ousted the Newman government from power in a spectacular yet ultimately uncertain election result. The ALP won 44 seats, one short of forming a majority government but went on to form a minority government with the support of the independent member, Peter Wellington. In the electoral campaign the ALP had promised to form a “listening government” that would restore honesty, accountability and transparency to government. This article questions whether this “collaborative governance” policy agenda can realistically be met by a government whose hold on power is so weak. In order to answer this question, the article first summarises the legacy of the Newman government with respect to planning and environmental matters. It then reviews the policy and law-making style of the new government in three areas: major urban development projects; the 2015 planning Bills and proposed reform of land clearing laws. It examines the range of pressures, political and otherwise, that confront a well-intentioned and reformist government. It concludes that, while there has been some progress, the Palaszczuk government is “battling the odds” to reap reform and not just because of its numbers in Parliament. While a consultative approach is particularly valuable for a minority government, it is not in itself a sufficient solution to the dilemmas of planning and environmental governance. Conservation of bushland on private property in Tasmania, as in other parts of Australia, has seemingly benefited from numerous regulatory and policy initiatives in recent decades. But more is not necessarily better; a smorgasbord of initiatives may lead to a hodgepodge of confusing and contradictory approaches. 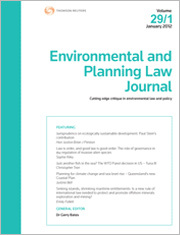 Through this article’s evaluation of governance of private bushland in Tasmania, a valuable case study emerges of wider relevance to the design of environmental law. Some theories of regulation suggest that a mix of instruments and actors can be advantageous – such as by efficiently and democratically tailoring governance to specific contexts rather than imposing indiscriminate, blanket controls. The Tasmanian experience suggests that such an advantage does not easily arise. The mosaic of governance in Tasmania includes local planning schemes, conservation covenants, threatened species legislation and forest practices legislation, in addition to federal regulation. Continuing land clearance and degradation in Tasmania is fragmenting and degrading wildlife habitat corridors and replacing old growth with young growth. To overcome such pressures may necessitate, perhaps counter-intuitively, a simpler approach and a new synergising process. This article analyses the concept of blue carbon ecosystems, particularly mangrove swamps, in two international law contexts: climate change law and environmental law. Aspects of the two international law regimes relevant to blue carbon ecosystems are identified and discussed, and it is argued that blue carbon ecosystems can be included in climate change mitigation strategies. Despite the potential difficulties associated with doing this via climate change law and environmental law, utilising a combination of the two regimes may be a sensible approach. Using Indonesia as a case study, the article concludes by outlining the applicability and ongoing implementation of the concept in that country, which has more mangrove coverage than any other country in the world. Indonesia’s ongoing endeavour to include blue carbon ecosystems in its climate change mitigation strategies is an innovative initiative. For the PDF version of the table of contents, click here: EPLJ Vol 33 No 1 Contents.